NEW YORK—Here in the U.S., the most popular sport is not baseball or the NBA or hockey or Serena Williams’ game or soccer. It’s American football. From the first name alone (“American”), we know that this game is deeply rooted to this nation’s 320 million people. The National Football League (NFL) is the name of the sport’s professional league. It features 32 teams divided into two groups: the National Football Conference (NFC) and the American Football Conference (AFC). The season doesn’t run for 12 months; it’s only from September until February and it culminates with the biggest sporting event in America: the Super Bowl. This season, it will be held on Feb. 1, 2015 in Arizona. The Super Bowl is that one-game-only Finals that is watched by over 110 million TV viewers. I’ve followed American football. This started back in high school at the Cebu International School when, surrounded by American schoolmates, we’d toss and throw the football. On TV, I watched the Super Bowl plenty of times. Featuring half-time performances that would invite names like The Rolling Stones, Madonna and The Black Eyed Peas, it’s a mega sporting and entertainment event. The hosting of the Super Bowl hops from one city to another. Last February, Super Bowl XLVIII was played at the MetLife Stadium in New Jersey. That’s where I was last Sunday. 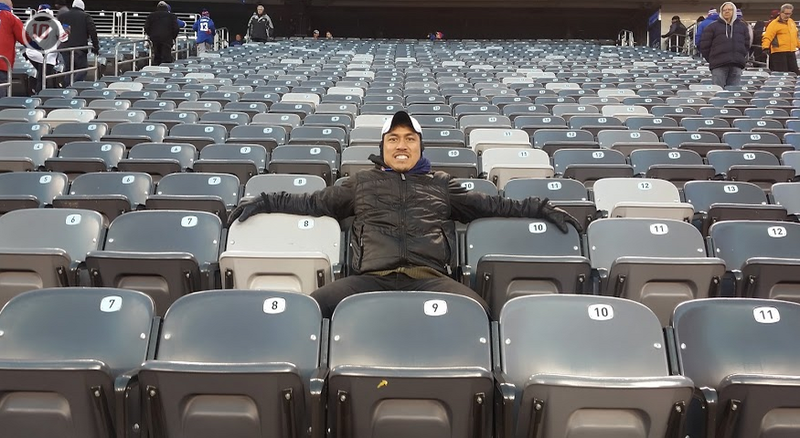 The moment when Jasmin, Jana and I finalized our plans to spend Christmas in the U.S., I contacted a friend to find time and join me in watching a spectacle that I’ve longed to see for years: a live NFL game. Ping-J Villegas is someone I’ve known for over 25 years now. Her older sister, Cefelin, was my girlfriend in high school and I’m very close to his two other siblings, Lovelin and JP. A huge sports fan who played basketball at CIS and Cebu Doctor’s back in Cebu, Ping-J has now resided in New York for over 17 years. Within minutes of my contacting Ping-J a few months back, we researched the options and Ping-J quickly bought tickets online. The date was set: Dec. 14 at the MetLife Stadium featuring the New York Giants and the Washington Redskins. From Cebu, we arrived at the Newark Airport in New Jersey the night before the game (Saturday) at 9 p.m. and made sure that no jet lag would hamper the following day’s excitement. After hearing mass at 10 a.m., Ping-J was right on time picking me up at 11. A Porsche Boxster, Ping-J’s two-seater of a sporting machine, stood shining at the front. We were off. The temperature? It’s 4 degrees Celsius cold in NYC. But that didn’t stop us from opening the hood of the Porsche and speeding towards the arena (at over 80 mph) in the New Jersey cold. We got to the Metlife Stadium early. The game was to start at 1 p.m. but, over an hour before the kickoff, thousands had congregated in the humongous parking area. For here’s what I learned about American football: it’s not just about the game. It’s family. It’s friends. It’s a Sunday timeout. It’s a moment to bond, to drink Bud Light, to wear blue Giants jerseys, to brave the bitter cold for warm smiles — this is a traditional American pastime. All the parking areas were filled with people cooking barbeque, sipping beer, munching hotdogs. It’s called “tailgating” and it’s part of the whole football experience. People arrive hours before the game, they take out their portable grilling equipment and they cook. And eat. And party. Ping-J parked the Porsche Boxster as we proceeded to the stadium. Security is tight, as what you’d expect from a gigantic event of 70,000 spectators. With an hour to spare, Ping-J and I did the one thing you do when you’re at a game: drink beer. We ordered two bottles (in plastic cups) each. With liquor, they’re very strict here: each one is asked to present an I.D. We sat just outside the stadium’s doors and talked about Cebu, our families, biking (Ping-J has a Cannondale road bike and he pedals often). 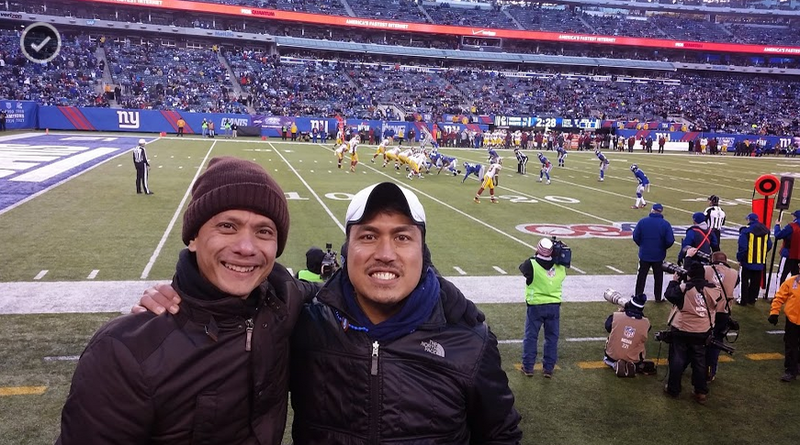 Ping-J Villegas and I watched the New York Giants vs. Washington Redskins game last Dec. 14. I wore three layers of clothing: an inner warmer, a Uniqlo sweater and a thick Zara jacket borrowed from Dr. Ron Eullaran. Gloves covered my hands; a beanie did the same with my head. A scarf wrapped my neck. It was 4C. The MetLife Stadium is gigantic. 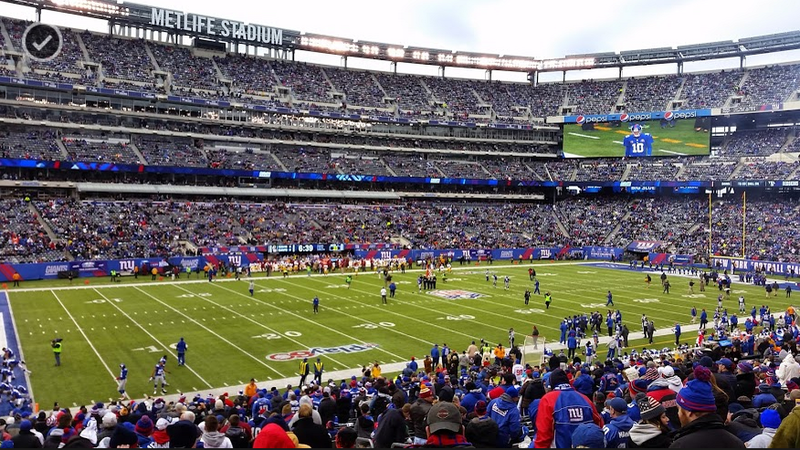 It seats over 82,000, making it the second largest among the NFL teams in terms of capacity. The other Sunday, I estimate the stadium to be 80 percent full. That’s nearly 70,000 people, all jammed in the same outdoor space, all cheering for the same blue team. What’s interesting about MetLife Stadium is that it houses two NFL teams, the NY Giants and the NY Jets. Yes, America’s most populous city has two football teams and, because they play just once a week, they alternate playing in the same arena — the only NFL stadium among the league’s 32 teams that’s shared by two teams. MetLife Stadium is new; it finished in April 2010 and is reputed to be the world’s most expensive stadium at $1.6 billion. The Redskins scored first, on a field goal (3-0). On the succeeding play, the Giants, led by 2-time Super Bowl MVP Eli Manning (Peyton’s brother) threw a pinpoint pass to a sprinting catcher who ran for a touchdown. After a successful extra-point attempt (via kicking), the score was 7-3 in favor of New York. Fans here are fanatical. They wear Giants shirts and all-blue; a popular activity is everybody standing up and waving the white towels (that were given to us for free upon entry) to cheer on the home team. What a sight: tens of thousands of Giants fans, all standing, cheering, waving the towels. American football is physical. It’s like boxing with body padding. Giant men with Schwarzenegger-like muscles barge into each other. They slam, tackle and block the offense. They’re 11 men on each side who bump, slam, barge head-on. You see sprinters who dart onwards. You see a kicker who’s brought in to score a field goal. You see the quarterback, the leader of the team, calling the shots and passing. That’s Eli Manning. What I’ve observed here: the people who troop to watch don’t come simply to watch. It’s more than a game; they cook barbeque at the parking lot and dine there for lunch (tailgating); they order beer and gulp a dozen; dads enjoy the company of their sons. It’s a whole American tradition every Sunday. You know how we get together every time Manny Pacquiao fights? It’s the same here on Sundays. For football fans, they either go to a real game to watch (and eat and get drunk), or congregate in a sports bar with friends, or they troop to someone’s house for lunch and watch the game on TV. Back to the game: After the Giants scored a touchdown, it was the turn of their neighbors from Washington, D.C. to score theirs. By the end of two quarters, it was 10-7, advantage Redskins. That’s when the combination of Eli Manning and Odell Beckham Jr. took over. Manning is the quarterback while Beckham Jr. is the wide receiver. Their tandem resulted in 17 more points in the 2nd half for the Giants. At game’s end, Beckham Jr. had 12 catches for 143 yards. The 22-year-old is poised to become not only the Rookie of the Year but one of NFL’s best. This month, he had dinner with LeBron and Michael Jordan and him are text-mates. Despite the 24-13 win by the Giants, they’re lousy this season. Prior to the Redskins game, they sported a 4-9 record (which included losing seven straight from October to November). Since then, they’ve recovered (winning three in a row) and now carry a 6-9 win-loss card. As recently as 2007 and 2011, they were Super Bowl champs. For a first-timer, what an experience for me to see this giant-sized American game.